Carlos Sainz Jr will take the DAMS Formula Renault 3.5 seat vacated by champion and McLaren Formula 1 signing Kevin Magnussen for 2014. Norman Nato will stay on with DAMS for a second season in the sister car. Red Bull protege Sainz had a part-season in FR3.5 with Zeta Corse this year alongside his primary commitment in GP3. "Since the first test I did with DAMS last year I sensed there was a great feeling between us and I have always wanted to be part of this team," said 19-year-old Sainz, whose father Carlos Sr won the 1990 and '92 World Rally titles. DAMS won the FR3.5 teams' title this year as well as taking Magnussen to the drivers' crown. Team boss Jean-Paul Driot said: "After a superb season crowned with success, DAMS is determined to retain its titles in 2014. 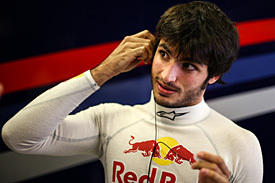 "That's why I'm delighted to welcome Carlos Sainz Jr whose out-and-out speed and professionalism are very impressive. "I can only say the same thing about Carlos and I hope he'll follow the same path in 2014." Nato graduated to FR3.5 with DAMS this year after finishing a close second to Daniil Kvyat in the 2012 Formula Renault 2.0 ALPS series. The 21-year-old Frenchman had a quiet rookie campaign and was only 13th in the championship, but Driot remains a firm believer in Nato's ability. "I'm also delighted that we've hung on to Norman," he said. "The team really wanted this as there's no doubting his talent. He and Carlos will make a formidable, complementary duo." This is a smart move by Red Bull. While McLaren can take responsibility for a lot of Kevin Magnussen's development and increased maturity over the last 18 months, the role played by DAMS cannot be overlooked. The French squad nearly came to blows with the McLaren protege at the start of this campaign, and it was not afraid to get tough and lay down the law with Magnussen about how it expected him to work with the team. The results were spectacular, and it should not be forgotten that Jean-Paul Driot's team played a similar role in grooming Romain Grosjean for an F1 comeback by taking him to the GP2 title in 2011. 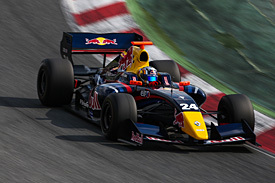 It's easy to overlook Sainz's part-season in FR3.5 this year. While he is by no means the finished product as a driver yet, much of the scrappiness of his season - following on from a stunning points-scoring debut in Monaco - was down to factors outside of his control. Zeta was a team in trouble at times last year as it fought to secure its future, and that occasionally resulted in Sainz and Will Buller battling against the odds in terms of equipment and preparation. Sainz will be hard-pushed to replicate Magnussen's form, but that is mainly a reflection on the stunning 2013 season that propelled the Dane to a McLaren F1 drive. Red Bull has shown faith in him - partly off the back of his performance in F1's young driver test at Silverstone in the summer - and it has given him all the tools required for a title push in 2014.